Or, according to the time he calculated from the wise men. Unspecified in the verses above. I’ve set the scene in the morning. In a street scene like this one, diffused sunlight comes from above. Notice that the walls of the buildings tend to be lighter at the top (nearest the source of light) with deeper, darker shadows at their base. The 2 stone archways are casting shadows onto the pavement below. Soldier taking infant boy from his mother, who is screaming in the doorway on the left of the scene. Her daughter is crying beside her. There is a second soldier behind, who has 2 wailing baby boys in his arms. On the right of this scene is King Herod’s advisor or scribe, who holds a wax tablet & is carefully tellying all the infant boys known to have been born in Bethlehem over the past 2 years. Notice the falling rag doll the foreground infant is dropping, & the discarded teddy bear on the pavement, between the soldiers. Notice I have made the babies cheeks very red, due to their crying! The soldiers also have red cheeks, perhaps because they are embarrassed & ashamed by their horrible task? Needless to say the screaming mother & her inconsolable daughter are also red in the cheek. I introduced King Herod’s wicked advisor (or perhaps he is a scribe?) in Matthew 02 – The Nativity – Scene 07 – King Herod & the wise men. He also appears in Matthew 02 – The Nativity – Scene 06 – Herod’s meeting. He looks a bit like a sorcerer or necromancer… perhaps he was! In the other scenes his faces looks rather cruel & malevolent. In this scene he looks a bit cross & impatient! 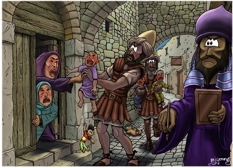 The soldiers have uniforms I designed for John 11 – Plot to kill Jesus, which I drew in 2009. I have used the same uniform in several other cartoon illustrations. These men are wearing tunics, with stiff leather armour over the top. I’m not sure that they would have been allowed to carry edged weapons (swords, spears, etc) since Palestine at this time was occupied by the Romans, & they probably wouldn’t have wanted anyone to bear arms, in case they fought against Roman rule. I suppose it was possible that King Herod & other powerful Jewish leaders might have negotiated with their Roman rulers to have a limited number of armed soldiers at their disposal. In any case, I have not shown these soldiers with any weapons that we can see. I took photographs of myself holding teddy bears to give me some figures to draw from! Matthew 02 – The Nativity – Scene 13 – Infants murdered – Townscape. 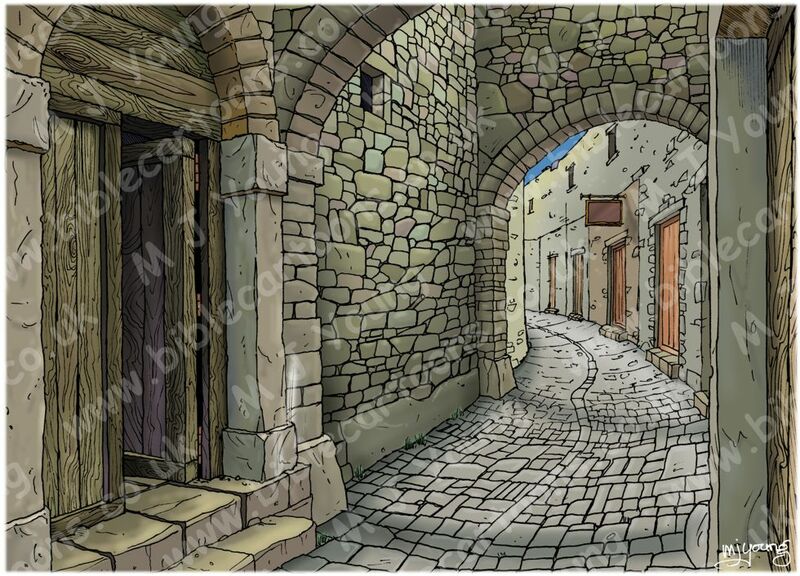 Background townscape scene, without the figures. Why draw this terrible scene? I found drawing this scene in pen & ink quite disturbing. I coloured the background & completed it before I moved on to the figures. I am very pleased with the way the street colouring turned out, from an artistic point of view; I think this is my best street scene to date. But colouring the figures was hard, as it evokes sadness in me. How cruel & horrible King Herod was, not to mention his advisor & soldiers who performed the terrible act. This scene still bothers me. I think it is the mothers stricken face & the sense of powerlessness she must have felt that disturbs me. So why did I feel it necessary to draw this scene? Quite simply I have drawn it because these events are recorded in the Holy Bible. I could have omitted this drawing, however, the events did happen, & that means I feel almost duty-bound to illustrate the scene. Regardless of what I think about it, I felt it needed to be drawn & presented her, because it occurs in the Holy Bible. I think I ought to illustrate whatever I read there, as it is all part of the story; part of the whole canon of scripture. ‘The nation’s future hope will contrast sharply with her present misery. The cry from Ramah was one of mourning and great weeping as Jeremiah pictured Rachel weeping for her children. To what was Jeremiah referring? Ramah was a town five miles north of Jerusalem, and Rachel was Joseph and Benjamin’s mother. Joseph was the father of Ephraim and Manasseh, who became the two major tribes in the Northern Kingdom of Israel. Thus Jeremiah was picturing the weeping of the women of the Northern Kingdom as they watched their children being carried into exile in 722 b.c. However, Jeremiah could also have had the 586 b.c. deportation of Judah in view because Ramah was the staging point for Nebuchadnezzar’s deportation (cf. 40:1). In all likelihood these women were crying because they would never see their children again. But as the women of Israel and Judah wept for their exiled children, God offered a word of comfort. There was hope for their future because their children would return to their own land. God would bring about a restoration.